If you are the kind of person who loves the whimsical or quirky ornament in the lawn, you may also be interested in having a whole fence that is also unusual. Because the following fences use materials that would usually end up in landfill, they make the ideal sustainable fencing. Fencing contractors may not have heard of them, but most would be willing to erect the kind of framework needed to make use of them. Not all councils would allow these kinds of fence, but if you are lucky enough to have few rules and regulations, you can often get these materials for free or almost free. 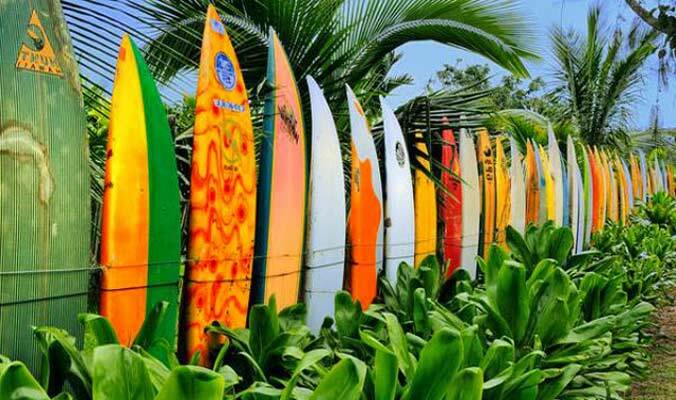 Surfboards make the ultimate picket fence with their pointed ends. They are colourful, offer privacy due to their height and don’t rust or rot. Add a strong timber framework to fix them in an upright position. Tin tiles from old ceilings make a beautiful fence due to the ornamentation on them. You can paint them different colours or the same. These too, need to have a framework to hold them.